Freeperiod was designed by educationalists who understand that what you need is a quick and easy way to share rooms and resources, not another timetable to manage. Signup now. Schools throughout the UK are using Freeperiod! Freeperiod is being used by schools throughout England, Scotland, Wales and Northern Ireland to share ICT rooms and resources. In fact schools are now using Freeperiod to share offices, equipment and much more. Signup now for a free 30 day trial and and see how other schools are managing their resources. Freeperiod is really easy to use yet transforms ICT management. 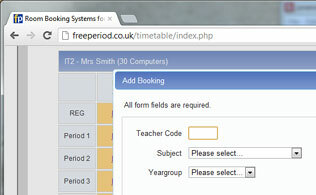 Using a few clicks you can capture teacher, year group and subject data for each period. 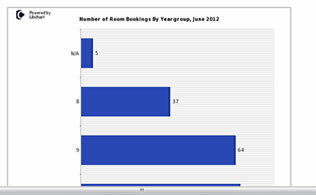 You can analyse departmental and ICT room usage through the use of graphical charts. Very useful data if you are working towards the ICT Mark. We support one week timetables, two week timetables and setting aside times for holidays. You can also display a note to staff based on the current week. Freeperiod is easy to setup. Simply email your existing timetable information from SIMS, or any other MIS system, and you will be live within 24 hours! "We have been using Freeperiod for well over a year now. Previously, booking rooms meant going the the room and checking a paper calendar which was not reliable and was time consuming , especially if you had to go to 3 or 4 rooms to find out nothing was available. Freeperiod has saved a lot of time for teaching staff and makes the best use of the rooms possible. Simple to use with excellent back up from the company. Very good value as well. Can thoroughly recommend." Lindsay Rouse, School Support Co-ordinator, Turriff Academy, Scotland. "If you want a website that's easy to use and does everything you want this is the one for you. Booking rooms and equipment has never been easier, before we used Free period everything was slow being booked on paper or email but now it's all done online so it gives us time to other things. I requested other equipment to be put on our site and this was done within the hour, fantastic." Mark Smith, Network Manager, North Shore Health Academy, Stockton on Tees, England. "I spent months researching booking software and none came close to the simplicity and ease of use that Freeperiod offers." D MacDermott, Webmaster, Belfast Model School for Girls (ICT Specialist School), Northern Ireland. "Free period has really helped us to improve the way we share ICT and other resources across the school community. 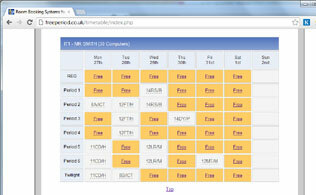 Staff can view the availability of rooms and key pieces of equipment at a glance and book quickly. We have had a lot of positive feedback since introducing Freeperiod, it is very easy to use and from a resource management point of view, the ability to monitor what is being used and when, helps in planning where to focus valuable school funds." Colleen Pinkman, Support Services Coordinator, Banchory Academy, Scotland. "At Integrated College Dungannon we find Freeperiod really useful for managing our ICT suites and some meeting rooms." W McCreedy, ICT Network Manager, Integrated College Dungannon, Northern Ireland. "Freeperiod, it does exactly what it says on the tin. Easy to use, well-designed and extremely functional piece of software." M Yetman, ICT Network Manager, Campbell College Belfast, Northern Ireland. "Having used Freeperiod for over 5 years now at school I have found it so useful to be able to check availability and book the computer rooms anytime of the week. As Head of a department, it is really useful to be able to check how much my department are using the computer rooms with the admin facility. This is a really useful piece of scheduling software." D Mooney, Head of Mathematics, Lagan College, Belfast, Northern Ireland. Try Freeperiod free for 30 days! Head teachers are still considering legal action after the exam regulator refuses to order boards to regrade this summer's GCSEs in English. Some 2,600 foreign students affected by the London Metropolitan University visa ban are given until at least 1 December to find a new course. Education Minister, John O'Dowd, asks the Northern Ireland exams regulator to carry out its own review into GCSE English grades. Michael Gove is asked by Labour to reveal how much has been spent on collapsed free schools projects. A university is banned from teaching and recruiting overseas students, leaving more than 2,000 potentially facing removal from the UK.